Awesome classroom themed bar in North Perth. Cocktails are a definite A+. 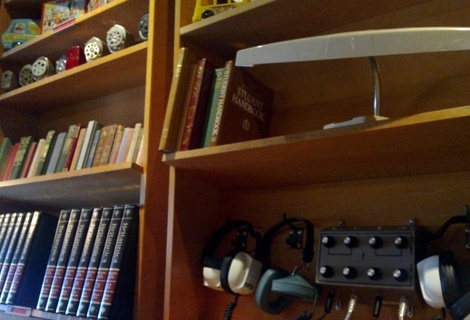 The Classroom was reviewed on Saturday 10th March 2012 12:03 by Richard. 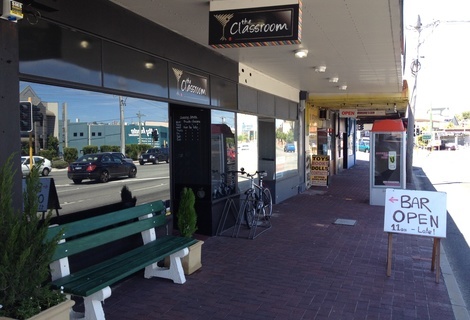 Yet another small bar has opened its doors in Perth, but this is unlike any other. 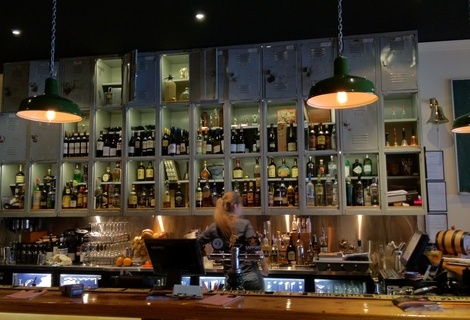 The owners have put in a considerable amount of effort to make the place look and feel like a class room out of the 90's, from the old school desks you can sit at to the lockers used as shelves behind the bar, it's absolutely amazing. Just about everyone who comes into The Classroom spends their first few minutes twisting and turning their necks to admire all the 'old school' nostalgia around the walls and the attention to detail that has gone into just about every aspect of the place. Having only opened its doors two weeks ago there didn't seem to be any 'teething' problems that most new bars experience (i.e. not stocking the correct quantities of food/drinks, or being drastically understaffed). 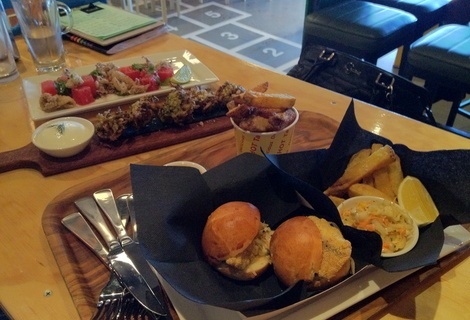 Everything was really smooth and I thoroughly enjoyed our lunch and drinks at The Classroom. A group of 3 of us headed down for a Saturday arvo lunch and a couple of drinks (more so the drinks, as it was already 37 degrees just before midday). We were greeted by the bar staff as we walked in and within one minute of sitting down at our table someone was bringing over iced glasses of water and explaining how the ordering system worked. I can see how some may think the ordering system is cheesy, but I love it! 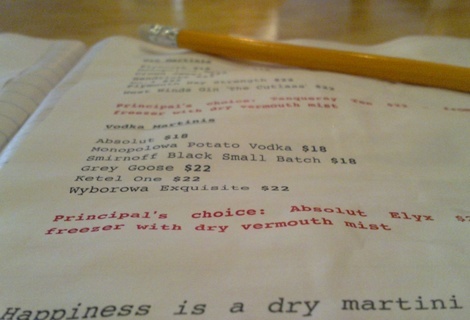 You select your meal options by crossing a box on an order form with one of the pencils on the table. You then hand it over to someone at the bar, pay for it and get handed a buzzer. When the buzzer goes off you collect your meal from the 'canteen'. It's the little things like these that add to the vibe of the place and really make it feel like you're back at school. The menu has quite a diverse range of tapas style servings. We ordered four options to share; the szechuan pepper squid, grilled fish buddies (mini burgers), zucchini fritters and the crinkle cut chips. The food didn't take long before it was ready for collection and overall was really good, A plus's all round except for the grilled fish buddies, which were more of a B minus, the mini buns were a bit flavourless and a bit too thick compared to the rest of the components inside the bun. However the squid and the chips were good and the zucchini fritters with cucumber and fetta whip were amazing, I was almost tempted to get another plate. 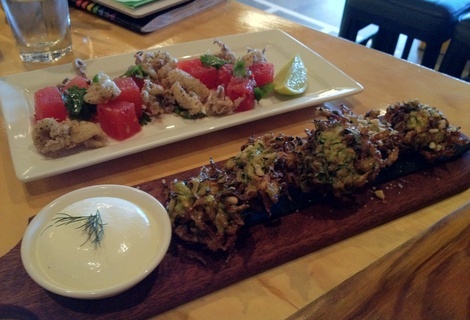 They were cooked really well, not too oily, and the fetta and cucumber whip did a great job of enhancing the dish. The service was great, really friendly and fast. Everyone behind the bar had a smile on their face and genuinely looked happy to be at work. We ordered a few beers to go with lunch, there are only a couple options when it comes to tap beers but a wider range of local and craft beers are available by the bottle. Another selling point of The Classroom is their cocktails, we couldn't leave without trying one so we ordered a 'Bunsen After Burner': Spiced Rum, bunsen-burned bananas, fresh pressed lime, maple syrup and smoky bitters. It tasted really good and had a fair old kick to it too. Most cocktails are around the $18 - $20 range, which is quite high, although they are quite big and definitely have the taste/kick to justify the price. Overall value is ok, most meals (remember they're tapas sized) are under $20 and the three we ordered plus the chips left us feeling pretty satisfied. But if you're starving and feel like a bigger meal it might be better to get a steak sanga at one of the pubs down the road. The crowd was quite young but you wouldn't feel out of place being a bit older. 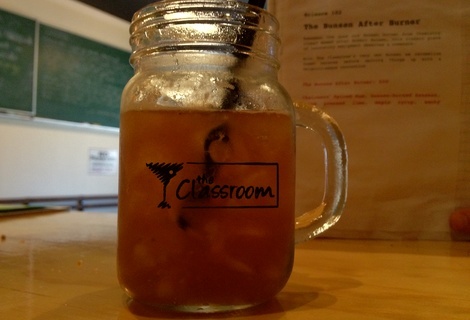 I would definitely recommend The Classroom to mates looking for a place to get a good cocktail or even just to someone who is looking for a change of scenery from their boring old local.